After Llunga Makabu’s devastating loss to Tony Bellew in liverpool,England last weekend, he has recieved the Golden Gloves Africa 2016 award on June 4th for being one of the top cruiserweights in the world.Even though Makabu lost his first title shot ,he is still touted to become a world champion and this award shows that he is embraced by Africa. Talented Nigerian Larry ‘The natural’ Ekundayo was all set to defend his African Union welterweight title against Tanzanian Saidi Mundi on the 4th of June at London’s famous York Hall, Bethnal green. Unbeaten Ekundayo unfortunately has a serious hand injury that he recieved during training ,in which the fight has to be postponed and rescheduled for later in the year. Ekundayo won the vacated belt by outpointing Joseph lamptey in october of 2015. The other title he has lifted is the Prizefighter trophy in 2012. Talented Japanese icon Momo Koseki has given up her WBA crown that she won by outpointing Ayaka Miyao in october. Koseki will continue to defend her WBC title and also looking to expand her Japanese record setting 16 defenses of the belt.Momo’s next bout will be announced shortly. Koseki has a record of 21-2-1,7 KO’s. 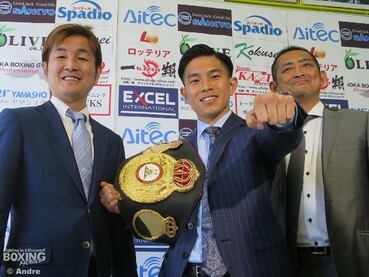 As I reported a few weeks ago that Suyon Takayama will challenge for Jack Brubakers OPBF welterweight belt on July 25th, another title fight will be added to the bill,this will be a bout for the Japanese Junior Welterweight belt held by Hiroki Okada.Japanese-Brazilian Cristano Aoqui is his opponent and with a win will extend his unbeaten record to 13-0 and will possibly set him up for an OPBF title shot. 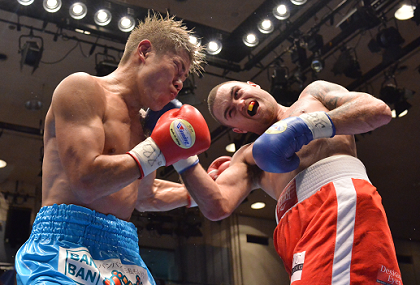 Aoqui has been awarded this fight off the back of a thrilling win over Ryosuke Takami, Aoqui will be looking to win his first Japanese title. Cristano was once touted to fight Takayama up at welterweight but it seems the lower weight is the better option for him. At the EDION Arena Osaka, Kuzuki Tanaka (5-0,4 KO’s) will be taking a massive step up in class when he takes on Japanese ranked Hideo Sakamoto. On paper this is a mouth watering clash which sees Sakamoto coming off a stoppage loss to Kentaro Masudo ,the Japanese champion and will be looking to get back into winning ways and will almost certainly come to fight. The supporting bout will see Fuko Komura making her debut as a professional in a 4 rounder against limited Koari Nagai (0-1). This looks to be an easy bout for the school girl Komura ,but it is the chief support on the bill and could perhaps be more competitive than people think. the show will take place on august 7th. On July 20th at the EDION Arena it was leaked that Kazuto Ioka (19-1, 11) will be defending his WBA Flyweight title against Nicaraguan Keyvin Lara (18-1-1,6 KO’s). This will be Lara’s first voyage into a world title fight and will be looking to take home the belt that Ioka won from Juan Carlos Reveco via a majority decision and retained it in a rematch by TKO. It must be noted though Lara looks to be up against it as Ioka is a former minumumweight world title holder (WBC and WBA), a Light Flyweight world champion (WBA) and after a split decision loss to Amnat Ruenroeng for the IBF Flyweight bauble came the Reveco fight that made him a 3 weight world champion. The other title fight on the card shows Shingo Wake (20-4-2, 12) go head to head with unbeaten Jonathan Guzman ,who has 21 vicories all inside the distance with 1 draw, for the vacant IBF Super Bantamweight title. Southpaw Wake of Tokyo, is former OPBF champion will have to have his witts about him as Guzman’s record suggests that he is obviously a banger. This bout is the co-feature and has been said to be in the negotiation phase for several weeks. Also on the card Takahiro Yamamoto will be defending his OPBF belt against Filipino Rex Wao. Rex (11-2,9 KO’s) has lost 2 of his last 3 and surely needs to make a statement to keep his career alive. Junior Middleweight Yuki Nonaka (29-8-3, 9 KO’s) will also be defending his Japanese title against Ryosuke Maruki (12-3-1,7 KO’s)that he won in a bout with Kengo Nagashima for the vacant title in 2014. There has been much speculation over the career of London 2012 bronze medalist Satoshi Shimizu. Within the next 2 weeks it is said that Shimizu will end his career in the unpaid ranks and will be turning professional with the Ohashi stable of talented fighters.It is believed that Satoshi is looking to face top opponents fairly quickly as he has not really got time on his side having turned 30. The Amatuer stand out has a good relationship with the Japanese amatuer body and will be welcome back to the amatuers should he ever want to return. The announcement will be between June 10th and June 15th and we will look to see him out before the end of the year. Hinata Maruta has been fast tracked to his first title bid when he comes up against fellow unbeaten Wilbert Berondo in a 10 rounder for the WBC youth title at the Sumiyoshi Ward Centre on 31st July.Maruta is a big prospect and is expected to quickly work his way to world contension and this is a step in the right direction. Having only his 3rd fight with 1 stoppage Maruta is a heavy favourite to win the title but little is known about his Filipino opponent. Berondo has wins over Ricky Oyan and Arjet Caballes and he made his debut in 2014,nevertheless any unbeaten fighter will want to remain unbeaten and with 53 rounds under his belt is vastly more experienced than Hinata with a record of 10-0,4 KO’s. Records can be decieving as Daiki Kaneko a loser of 3 of his last 6 came out a deserved winner against Ribo Takahata at the Korakuen Hall via a 10 round decision (98-91 on all cards). While Kaneko was seeking a knockout throughout the fight the old tale came true ‘when you go looking for a knockout ,it never come’,and for his efforts Daiki had to settle for the decision. Now Kaneko can improve to 23-5-3, 15 KO’s ,while Takahata slumps to 12-7-1,4 KO’s. In a minor upset Masaru Sueyoshi (12-1, 7 KO’s) recorded his 9th win in a row by outpointing Shingo Eto (17-5-1, 9 KO’s)as he stepped up in class to claim a hard fought 8 round decision with scores of 77-75,78-75, 78-74. Although many of the rounds were hard to score ,the right man was victorious. Kenji Ono scored an 8th round stoppage over Takumi Suda ,which may mark a step towards the Japanese title. Ono (11-1,6 KO’s) is a very exciting fighter and he did not disappoint as his talent was shining through and was simply too much for Suda who now has an a record of 12-12-2, 3 KO’s. Japans 2 -weight world champion Hozumi Hasegawa will make an attempt to become a 3-weight world titlist as he is set to take on WBC Super bantamweight champion Hugo Ruiz in Japan.There is no date set for the fight ,but it is rumoured to take place either in August or September . Hasegawa (35-5, 15 KO’s) is looking to impress in his home town and a win could make him a bigger icon than he already is and put him up there with the greats. Indian superstar Vijender Sing is looking to extend his unbeaten record to 7 when he faces former European champion Kerry hope of wales for the WBO Asia Pacific Super middleweight title.Hope is fighting for the first time as a Super middle and has portrayed himself as the bad guy and has made it crystal clear that he is not there to make up the numbers. This marks Singh’s first bout in India having fought exclusively in Britain and the Republic of Ireland. the fight will take place at the Thyagaraj Stadium in New Delhi on July 16th.